South Shields line up against Southampton in the South Shields FC International Tournament. 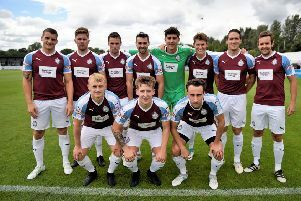 South Shields joint manager Lee Picton reflected on a “surreal” three days after the Mariners hosted Celtic, Marseille and Southampton’s Under-23s sides in a tournament over the weekend. Shields were beaten 3-0 by Southampton on Saturday and 2-1 by Celtic in the third-place play-off, but Picton was left satisfied with his side’s work. The weekend as a whole also left him enthused. Picton said: “It was a brilliant weekend. It was surreal turning up to watch the game on Friday to see Marseille and Celtic on the Mariners Park pitch. “The only thing that let us down over the weekend was the weather, but there was nothing we could do about that. “It was still a fantastic exercise and I hope that the other three teams feel the same way. 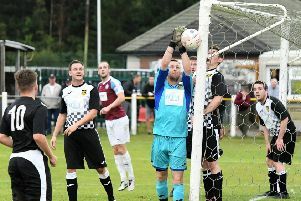 Shields are preparing for the start of their league season on August 18, and used a high number of players across the two games over the weekend. Picton added: “We achieved what we wanted to achieve out of the tournament, in terms of getting players about 120 minutes each across the two games. “It was a great exercise for us from a tactical and physical perspective. “We’ve used a lot of young players in pre-season and given them some great experience, but it’s now time for us to focus the squad, cut things down numbers-wise and really start to prepare for the season. Shields led 1-0 against Celtic in the third-place play-off, but a strong second half display from the Scottish side earned them a 2-1 win. Picton was pleased with his team’s performance, though. He added: “I thought it was a really encouraging display from us. “We bounced back from Saturday’s game and controlled things. With a bit more ruthlessness and clinical finishing, I thought we could have been a lot more comfortable than 1-0 up at half-time.